COPYRIGHT © PICTURES BELONG TO JUSTICE 4 MARK DUGGAN CAMPAIGN. 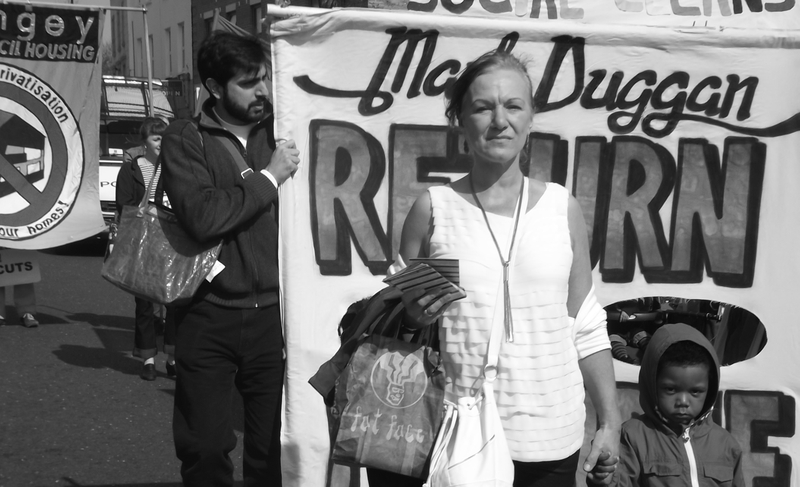 Several hundred people joined Mark’s family and friends today to demand justice, truth and accountability for the death of Mark Duggan 3 years ago today. The family launched a fresh witness appeal and announced plans to establish a trust to fund projects in support of local young people. Many other justice campaigns and family members including Janet Alder, Marci Rigg, Kadisha Burrell Brown, Myrna Simpson came out in support in addition to members of the community including Winston Silcott. Susan Alexander, whose son Azelle Rodney was shot dead by police, sent a message of support – and people pledged the news that a Met officer is to be prosecuted for murder in that case should be just the beginning. 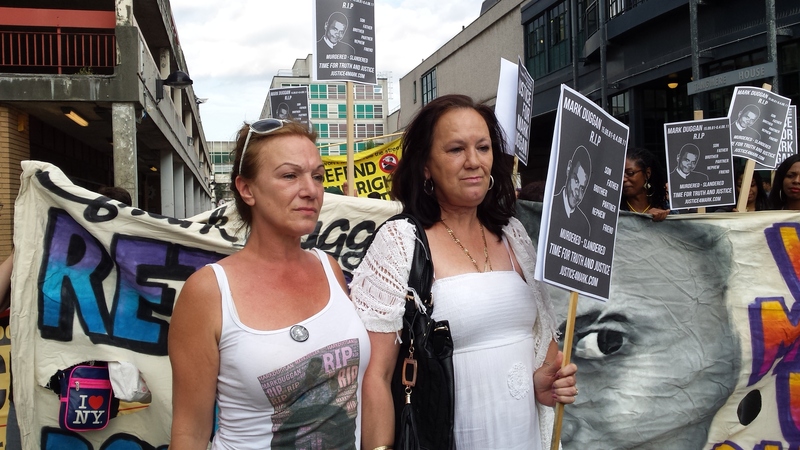 The Justice 4 Mark Duggan campaign would like to take this opportunity to thank all those who attended the march and vigil and supported the journey towards truth and justice. The family and supporters of Mark Duggan are urging anyone who was in the Ferry Lane and Tottenham area on the day of Mark’s murder to come forward as witnesses. Within hours of Mark being shot dead by armed police on 4 August 2011, stories were circulating about a dramatic ‘shootout’, a ‘violent gangster’, and gangland ‘revenge killings’. Long before the jury sat in the courtroom, the police, Independent Police Complaints Commission (IPCC), the judiciary, and the media all played important roles in determining how the shooting was framed. Mark was shot and killed in broad daylight. The family believe this is why Mark was falsely presented as a ‘gangster’ – in order to discourage and scare witnesses from coming forward. The family believe that witness statements can be a crucial part of bringing new evidence to light in the fight for justice for Mark. Previous cases of injustice have shown just how important witness statements have been in countering the police and media narratives of events. On 16 December 1994 Shiji Lapite was stopped by two police officers for “acting suspiciously”. Half an hour later he was dead. The cause of death was asphyxia from compression of the neck consistent with the application of a neckhold. Two police officers’ statements had claimed Shiji was acting suspiciously and in the officers’ notes Shiji was represented in a stereotypical and racist way, as a Nigerian drug dealer. These police profiles were taken up by the mainstream press, who used rumours of the victim carrying drugs, to criminalise Shiji and to attempt to cut off any sympathy for him. Shiji was presented during the inquest as “the biggest, strongest and most violent black man he’d [the police officer] had ever seen”. The Home office pathologist said Shiji was 5”10 and of medium build. The officers described him as a “ferocious animal”. A witness said he saw Shiji being continually punched and kicked – but the officers argued they fought Shiji off in self-defence. The most serious of Shiji’s injuries show crushing of his bones round his voice box. Just four months after Shiji Lapite’s death, on May 3 1995, 33-year-old Brian Douglas was on his way home when he was stopped by two police officers, PC Tuffy and PC Harrison. Brian was with his friend Stafford. The officers ordered them out of the car and, apparently unprovoked, hit Brian on the head with a new US-style baton. Brian had a fractured skill and was falling in and out consciousness, yet the police kept him for 15 hours before taking him to hospital. He was declared dead on 8 May. In the police’s internal investigation, PC Tuffy claimed he hit Douglas on the shoulder and that the baton slid up to strike him on the head. The Douglas family began a door to door witness appeal. Brenda Weinberg, Brian’s sister, says that “There were several witnesses which actually saw the blow to Brian”. According to one witness, the officer “turned and made an over arm blow”. So there’s nothing that could have slid up! The blow came from an over arm movement – the strongest force you can use. To the family, that was not an accident, or even a defensive move, it was an attack blow. The IPCC attempted to gather witness statements when they were gathering evidence to be used at the inquest into the murder of Mark. It was noted that CCTV footage was gathered from “a number of sources” and then synced. But where was this footage gathered from and was all the evidence available used in court? The IPCC was allowed to see intelligence relating to the planning of the Met police operation. However, when the IPCC commissioned a local superintendent to prepare a report on this, the evidence was prevented from being released, effectively denying the IPCC any access to police intelligence concerning the operation. Legislation passed over the last 15 years has progressively increased the use of secret evidence, which has significantly undermined the accountability of policing operations. Most of the ‘information’ concerning Mark’s actions came from the armed officers who gave evidence at the Kevin Hutchinson-Foster trial, which was splashed round the right wing press – including the unproven allegation that Mark was holding a gun. CO19, armed officers, supported the operation (‘mobile armed support to surveillance’) gave their account at this trial. This is where the claim that Mark had been holding a gun began to emerge, unchallenged. Months before the inquest. By the time of the inquest, in September 2013, it was the IPCC who had gathered ‘most’ of the evidence, while public opinion had been guided considerably by the Kevin Hutchinson-Foster trial. The mainstream press used this trial to present the police profiles as the main source of accurate information. A. He said he had no trust towards the police. He talked about events, and there are some notes that I’ve made, you know previously, but he talked about that he had no trust towards the police and that he would not go to the police. A. He would not go. He would not go to — he did not want to go to the police and he did not want to go to the IPCC and I sensed that he was very scared. Q. Could you work out who he was scared of? A. He was scared of the police. “So things like that played on my mind for a bit, as well, and you have people also talking, a whole bunch of stuff as well. So — yeah. Question: “What sort of things? Join us on the third anniversary of Mark’s death. 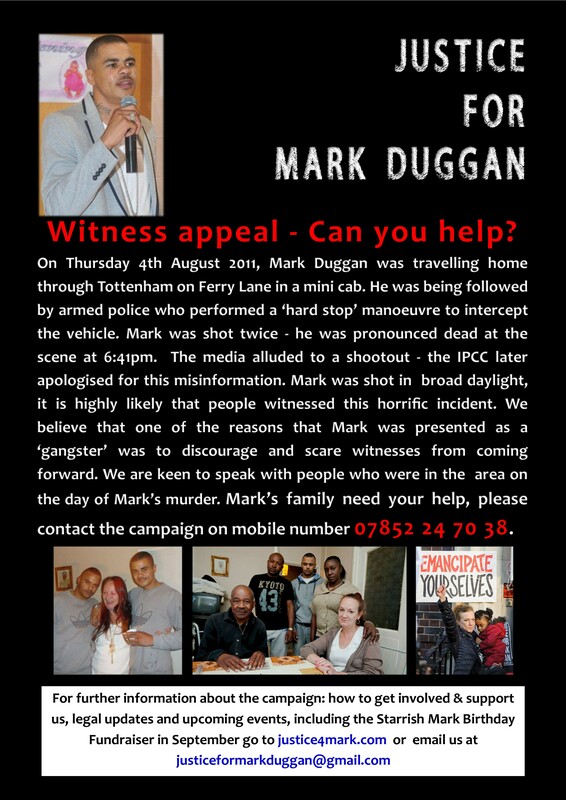 Mark’s family are still fighting for justice and they need your support. There will be a meet up point at Broadwater Farm at 5pm. 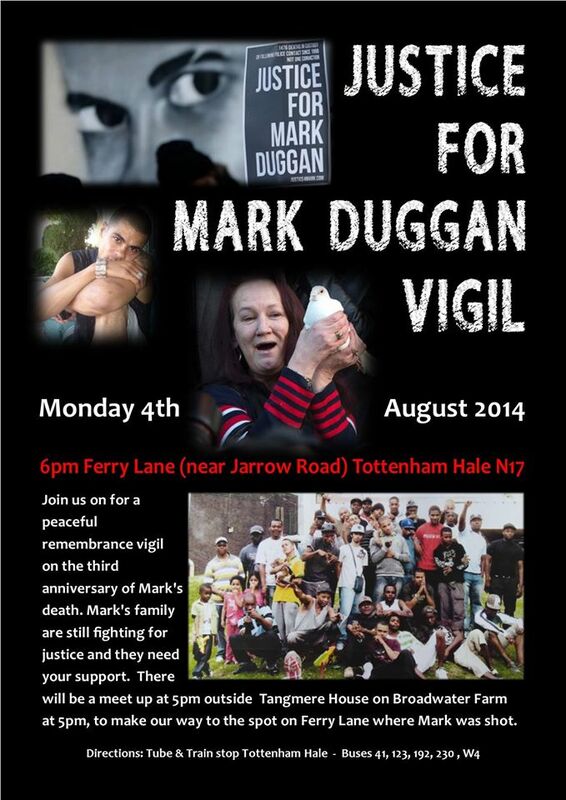 The Vigil will take place at 6pm, Ferry Lane, where Mark was shot. To join the Facebook event page click here. The Coroners Report from the Inquest into Marks Death was published this week. It contains a number of criticisms and recommendations regarding: a failure to video record the crime scene; allowing firearms officers 48 hours to compose themselves before being questioned; and denying the IPCC access to police intelligence. Support us on the 8th and 9th of July at the Royal Courts of Justice where our judicial review of the Inquest verdict will be heard. Please comment/email if you would like your email address to be added to our mailing list.